Jack is officially six months old... HOW and WHEN did this happen?! He is growing so quickly, getting teeth, he knows and responds to his name (when he wants to...), and is absolutely as sweet and cute as can be. Here's an update on his sixth month of life! Jack turned 6 months old on April 25th at 11:23PM! Jack weighs 20lb 5oz and is in the 90% for weight; he was 8lb 6oz when he was born. Jack is 27 inches long and is in the 65% for length; he was 21.5 inches long when he was born. Jack eats 5 times per day and still gets exclusively breast milk. Who knows how I lasted this long nursing him... I really didn't expect it if I'm going to be honest, but I am so thankful that it has been pretty easy for us. In addition to milk, we have started Jack on some solids. Last month he had oatmeal and sweet potatoes, and this month we tried peas! I was expecting a strange face when giving him the peas (since it was his first green vegetable), but he seemed to enjoy them right away. He actually really loves food, and I am so surprised how well he does actually eating (and not just getting it all over his face!). He leans into the spoon and grunts wanting more if you take too long... The boy has a very healthy appetite! He is so interested in food and is always reaching for ours. I feel a bit bad because this month it has become more and more clear that he is interested in and ready for solids, but we have just been so busy that I haven't had the time to really start going full force... that is on my list of things to do for month six! He is also really starting to communicate with us in other ways too - he had a bottle of milk, and he started reaching for it and grunting trying to get it. It took me a second to realize what was happening, and it was the first time that I have ever seen him really communicate (in a way that I could understand) and ask for a bottle... lots of brain development this month! I still have a ridiculous amount of breast milk frozen (around 800oz) so this past month I started the donation process to donate some of it to make room for other things (like more milk... or actual food!). I'm donating through the Austin Mother's Milk Bank and they require you to donate 150oz to start. I'm sure I'll end of donating most of everything that I have, but I want to hold on to some it until it is all closer to expiry just in case I may need it. The process to donate was quite extensive and took about a month (a paper application, a phone interview, blood work, OB and pediatrician forms, etc. ), but it is a worthy cause - all of the milk is given to infants in NICU who are prescribed the milk from their doctors. About half way through the month he started to really fight his naps. It took us awhile to adjust (since I first thought he was fighting his naps due to teething), but we extended his wake time between naps from 1.5 hours to 2 hours and he has been going to nap much better ever since. We still are doing two good naps and a cat nap in the evening, but I bet that in the next month or so we will be transitioning down to only 2 naps. Jack's sleep cues have become more and more obvious this month. When he starts to get tired he gets very loud with screams (not crying, just being silly with shrills and shrieks). He then will move to non-stop raspberries. It's all super cute and we think it is the funniest thing, but we know that when it starts to happen it is our 15 minute warning that he is going to start getting frustrated and upset if we don't start getting him ready for a nap or bed. Jack has been loving sitting up, and I am so impressed with how well he has been doing! He could hang out in his Bumbo all day and loves the new views that he has when he gets to sit up. He still can't quite balance unassisted (he's pretty top heavy with his sweet cheeks! ), but I think in only a couple more weeks he will be sitting up by himself. Jack also loves peek-a-boo. I'm unsure if it is the hand motion he likes or the sound of the "peek-a-boo!! ", but he really thinks it is pretty fun. We also Facetime my parents pretty often and Jack loves to hear their voices over the phone. I don't think he can really see them on the screen, but he can definitely hear and reacts to them. He is constantly reaching and grabbing for the phone too... it's pretty cute! This month Jack has also been loving to show off his new raspberry skills... one day he realized he could do them, and he hasn't stopped since! Sometimes I think he forgets how and will start playing with his tongue until he can figure it out again. It is super funny, and I love seeing him do it. Jack got his first two teeth this month, and he very much dislikes teething... poor guy (and poor momma too!). Jack's first tooth broke through only a few days after turning 5 months old. I swear, he was fine one day and then the next day he had a tooth! I bought him just about every teething toy I could find on Amazon Now, but he was still pretty upset. His second bottom tooth broke through a few weeks later. Although Jack doesn't mind one bit, he is still spitting up quite a bit (which I dislike!). Without fail, any time you put him in his car seat you can count on him spitting up - you've got to have a bib ready! The doctor has assured us that it is nothing to be concerned about because Jack does not express any discomfort when he spits up and he is gaining weight wonderfully. I'm happy that it is nothing to worry about, but I am so ready to not have spit-up all over me (or him!) every single day. Jack and I basically hang out in our pajamas all day since we don't want to risk getting our nice clothes dirty! I am very much looking forward to this phase passing so both he and I can start to wear "normal" clothes. Jack got to ride on John's shoulders for the very first time this month. Despite me telling John that Jack was a bit too young, John insisted and basically demanded that Jack ride on his shoulders. Jack had fist fulls of John's hair and very much enjoyed taking big mouthfuls to try and taste it. Jack still doesn't pay much attention to Scout and Lily (our dogs), but he really lovesss our kitty, Winnie. It is the sweetest thing ever... I will bring Jack up to Winnie, and Jack will reach for her with his hands open to grab her fur. Winnie doesn't mind at all and is a really good sport about it. Since Winnie sheds and Jack is reaching to pet/grab her with drooly little fingers, he always ends up with his hands covered in hair which is pretty gross to clean off - but oh well, they seem to like each other and it is fun to watch Jack bonding with my (almost) 16 year old cat that I had growing up! Jack is wearing 9-12 month clothes. He hasn't had to wear anything past 12 months yet, but I'm sure it won't be too long before we start picking up an outfit or two in a larger size. As far as diapers, he is wearing size 4 and will probably be staying in them for awhile longer... they fit him well and he's got a bit of room to grow. Jack lets out the cutest screams ever. After he screams he will look at me, and then I scream, and then he screams, and then I scream... and we repeat and repeat (yes, this is the kind of fun we have at our home)! I find it the absolute cutest thing ever, and although I'm sure it won't always be cute (like when we are at a nice dinner or something), I am absolutely loving our "conversations" in the mean time. This past month Jack also took his first vacation! We went to Arizona for a long weekend, and he had so many firsts... first time leaving Texas, first plane ride, hotel stay, hiking, swimming pool, and meeting so many new baby friends. Another favorite moment was celebrating Jack's first Easter. Both John and I pray that as Jack grows older that he will understand what this day represents and the life in Christ that he can have because of what our Savior did for us; John and I want to live lives that point Jack to Jesus. We also sent out a six-month update card to friends and family. So many people love on and have invested in Jack's life, and we are very thankful for that. 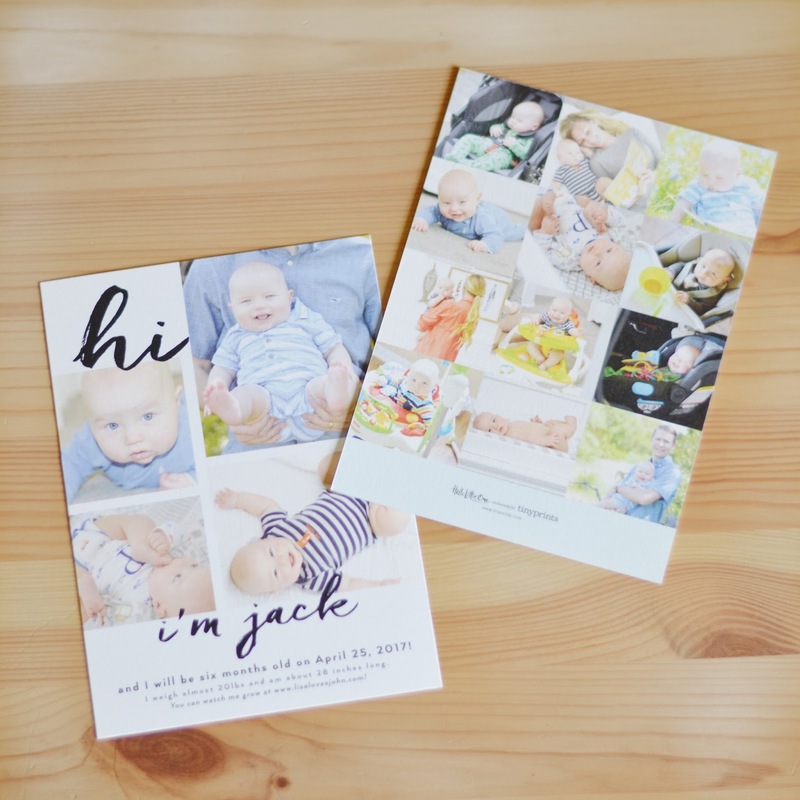 We want to keep friends and family up-to-date with Jack's happenings, and we thought this would be a fun way to share printed pictures... and who doesn't love snail mail?! Baby babbles with more vowels! Jack does lots of grunts, shrieks, and screams, but he doesn't do much vowel babbling yet (ba-ba, etc.)... and I can't wait for this type of "talking!" I'm also looking forward to my first official Mother's Day. Nothing big is on the agenda, but I'm looking forward to celebrating with my cutie(s)! Jack is five months old... which is basically six months - which is half of a year... how is my baby a half year old?! I know everyone says and thinks that their baby is the best, but I really do think Jack is the best baby ever. He makes being parents so easy on us - he is laid back, sleeps fantastic, eats well, and gives us all sorts of smiles and giggles... we just love that little boy so much! Jack turned 5 months old on March 25th. Jack weighs 18lbs 13oz. We just transitioned him into size 4 diapers, and they are a bit big on him, but I didn't want to buy a whole box of size 3s and have him grow out of them too soon. And, to be honest, I just prefer a bit larger fitting diaper so I don't feel like I'm cutting off circulation to his chubby thighs! Jack gets exclusively breast milk and is fed 5 times/day. Nursing is becoming more and more challenging as he grows... he loves to eat for 2 seconds and then grab my face, eat for 2 seconds and then look out the window, eat for 2 seconds and then try to sit up, eat for 2 seconds and then flash me the biggest smile ever... and heaven forbid I cough - he will immediately stop eating and give me the most puzzled look ever. Honestly, it is all pretty cute, but I worry about him getting full feedings since he gets so distracted! This month Jack also tried oatmeal for the first time... and he liked it! No weird faces or anything, which was slightly underwhelming, but I'm sure that as he starts to try more vegetables we will get plenty of silly faces. He also tried sweet potatoes; they were his first veggie and he liked it! There probably wasn't too much to taste since I mixed it with milk, but he still seemed to enjoy it! Jack sleeps from 7PM-7AM with no wakes - how's that for amazing?! We aren't militant about his schedule, but he does follow it within 30 minutes or so. However, the bed time is pretty firm... Jack will pretty much lose it if you put him to bed after 7PM - he won't want to eat and he gets quite upset until you finally lay him down to go to bed. So in order to make sure he gets a full feeding, I start feeding him at least by 6:45PM. During month five we were able to extend Jack's wake periods between naps and he did great. He had started fighting going down for naps, so I figured I would let him stay up a bit longer and he transitioned back into his naps perfectly. He takes good, solid naps (about 1.5-2 hours) and a short cap nap (50 minutes, or so) in the afternoon. I was pretty concerned with day light savings, but it really wasn't too bad. We had one day that was a bit messy, but other than that, Jack settled right back into his routine. Jack absolutely lovesss his crinkle book that my parents gave him. He holds it tightly every time he is in his car seat and it is the sweetest thing ever. He also has a rattle teether that he really enjoys taking in his car seat too. Jack also loves being carried around. He really did not like the Ergo when he was an infant, but now that he is older and can face outward, he loves being worn (as long as you don't stop moving!). He also found his thumb and realizes that he really enjoys sucking on it! I know I shouldn't love it, but it's super heart melting watching him do it. Now that Jack can grip so much tighter, he is constantly grabbing and touching our faces. It's super cute to see him do it because half of the time he is very gentle and thoughtful, but the other half is he having fun and is pretty rowdy about it. Jack no longer likes his swing. If you put him in it, he will try to ninja kick out - it's super funny to watch, but definitely not safe for baby! So in an effort to keep our living room from looking like a baby carnival, we have officially retired his swing... which is SO okay with me - that thing was an eye sore! Jack also very much dislikes staying awake past his bedtime. He is clearly his mother's child and loves his sleep. John has said several times that they are going to watch all sorts of classic Western movies when Jack gets older too... I love that he is thinking about these things now! I say this for every monthly update, but John remains Jack's favorite person. He just loves his dad so much and immediately gets a big smile as soon as Jack sees John... especially if John is holding him and they go look into the mirror together - it makes my heart burst! And John loves Jack just as much. John is always saying about how he wants to take Jack fishing or bring him to his favorite little river in Arizona. Jack is wearing 9-12 month clothes - how is this possible?! Whenever I buy him new clothes, the first thing I do is wash and dry them so that they more accurately reflect the size they will be once they shrink. Otherwise he wears them once, they get washed and shrink and then needs to be put away in storage. Jack found his toes this month and loves to eat them! I joke that he folds in half for easy storage - that kid is flexible! Jack also tightly grips when you pick him up, and I absolutely love that he now holds on. That being said, he often gets fists full of hair, which is quite painful! Jack also spins himself in circles when he is in his crib. I'm not exactly sure how he does it, but we put him in his crib facing one direction and then when we go back to wake him up, he has completely spun himself around! We are looking forward to our first family trip back to Arizona this month! It will be Jack's first flight and we are excited to show him all of our favorite places in the valley of the sun.